Summer 2019 might feel like a long way off, but there's nothing like doing a little early holiday planning - particularly with some of the coldest, darkest months ahead of us. And if you've already got your travel wish list for the year ahead sorted, you're not the only one. The Association of British Travel Agents (ABTA) has revealed its trends for 2019 and according to the report, tour operator and travel agent bookings for summer next year are up 12% from this time last year. As for the most popular destinations? Europe tops the list of places people hope to visit in the next 12 months, with 61% of holidaymakers planning a trip to the continent next year. The travel authority notes that Bulgaria and Greece are set to perform particularly well with an increase in bookings for summer 2019 up 30% and 6%, respectively. 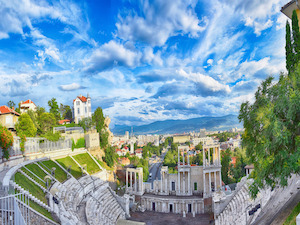 Although Bulgaria has always been favoured for its historic landmarks, beautiful beaches and cheap prices, it's set to be in the spotlight in 2019, when the ancient city of Plovdiv will be the European Capital of Culture. Resorts including Sunny Beach, Golden Sands and the UNESCO world heritage town of Nessebar are known as the hot spots, with visitors favouring Borovets, Bansko and Pamporovo in the winter months for their good value ski holidays.